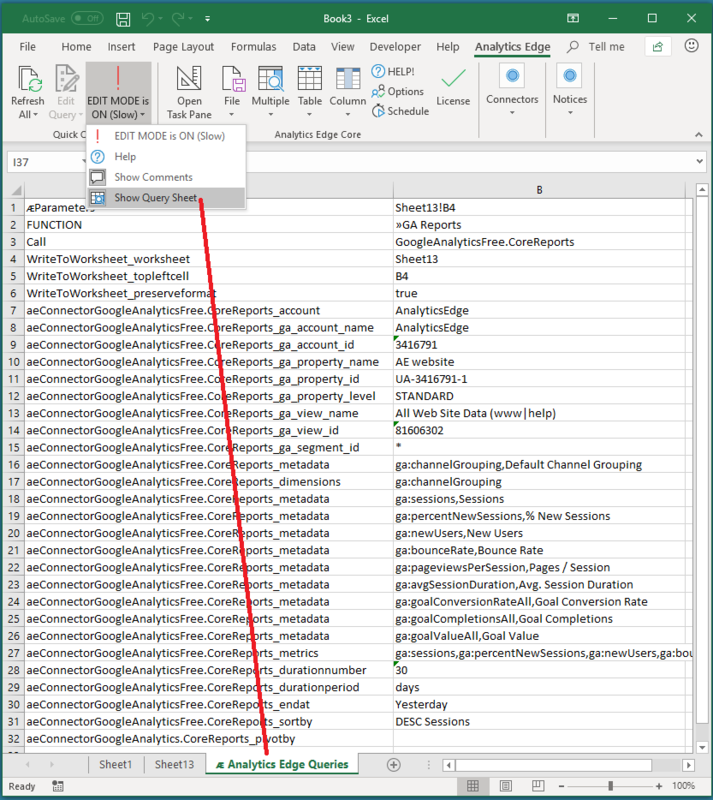 The old Excellent Analytics conversion utility is no longer available in the latest release of the Free Google Analytics connector. It has been over 4 years since the old open source Excellent Analytics code stopped working due to an authentication change at Google, and Analytics Edge’s new Quick Query capability makes it easier to manage your queries. Simply select the Edit Mode > Show Query Worksheet menu from the Analytics Edge ribbon to reveal all of the parameters for your saved queries. Edit them directly if you want or use the Analytics Edge query wizards to do it for you. Don’t see the EDIT MODE button? Upgrade to the latest release! This entry was posted in Google Analytics on 2014/07/22 by functions.